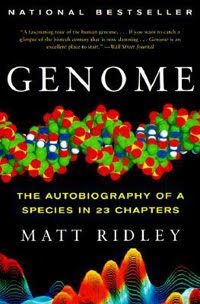 Have you ever read Genome by Matt Ridley? If you haven't you should. Genome was written shortly after the completion of the Human Genome Project and it goes through each human chromosome— in order dictated by the human karyotype— personifying it, explaining its origins and the traits or diseases that might occur on the chromosome. Ridley has a gift for explaining complex scientific processes in a way that easy to understand especially if you have any background at all in genetics. I first read it in my senior year of high school for my Honors Genetics class. Each Friday, we'd have a Socratic seminar discussing a chapter the book while snaking on the pretzels my school's chapter of FBLA sold. *daydreaming: "Ohhhhh...the good times"*. But, anyways, It's a really good fast-paced read and a must for anyone even vaguely interested in science or medicine.